The latest long-term forecast from Bloomberg New Energy Finance (BNEF) shows sales of electric vehicles (EVs), increasing from a record 1.1 million worldwide last year to 11 million in 2025, and then surging to 30 million in 2030 as they establish cost advantage over internal combustion engine (ICE) cars. China will lead this transition, with sales there accounting for almost 50% of the global EV market in 2025 and 39% in 2030. The number of ICE vehicles sold per year (gasoline or diesel) is expected to start declining in the mid-2020s, as EVs bite hard into their market. 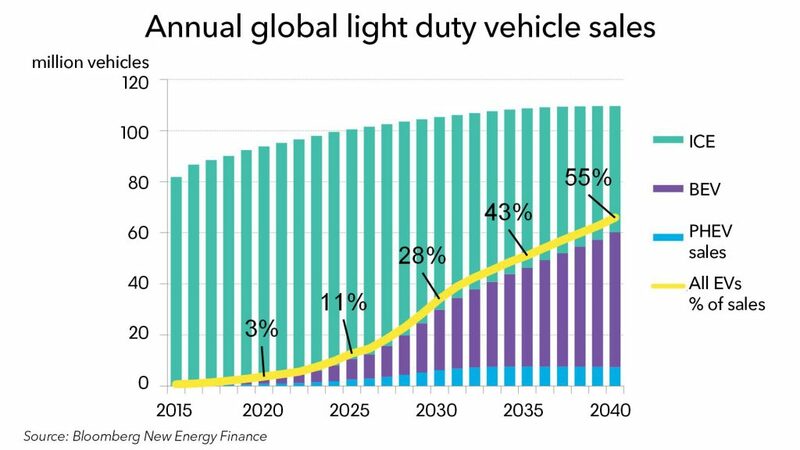 In 2040, some 60 million EVs are projected to be sold, equivalent to 55% of the global light-duty vehicle market. ‘Shared mobility’ cars will be a small but growing element (see below). The advance of e-buses will be even more rapid than for electric cars, according to BNEF’s analysis. It shows electric buses in almost all charging configurations having a lower total cost of ownership than conventional municipal buses by 2019. There are already over 300,000 e-buses on the road in China, and electric models are on track to dominate the global market by the late 2020s.